France battles Korea and Japan in the pseudo-SUV world cup! Which car walks away with the trophy? It’s evident that when it comes to styling, buyers in this segment will be spoilt for choice. 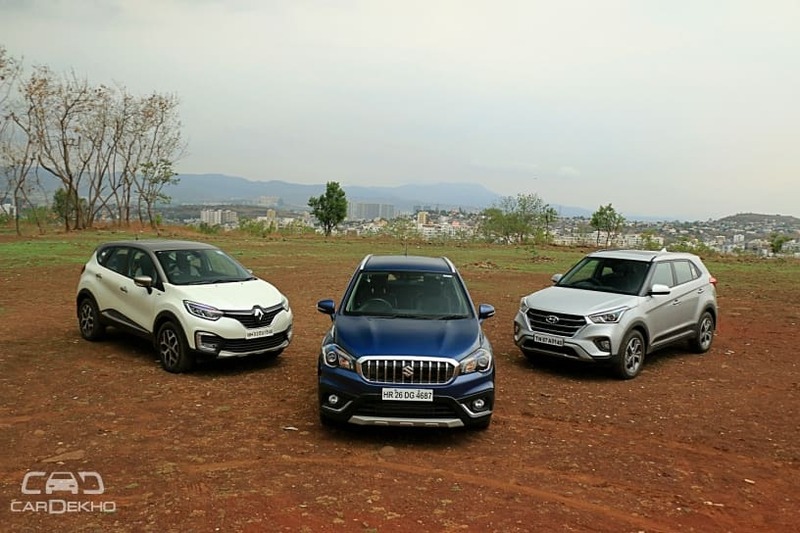 While the Hyundai Creta takes the more traditional boxy-SUV approach with its design, both the Maruti Suzuki S-Cross and Renault Captur are curvy crossovers. However, what’s common to all is that they try to give you the all-important butch appeal. The S-Cross does it with a heavy dose of muscular lines across the bonnet and body panels, throwing in the segment-stable black body cladding. Even though it’s the smallest car here in every dimension (including its wheels: S-Cross gets 16-inch wheels compared to the Creta and Captur’s 17-inchers), the S-Cross does have strong presence. It even has a healthy 180mm of ground clearance, should you want to go exploring after the road ends. But if it’s road presence you want, the Renault Captur delivers and how! While the curvy styling and rounded haunches give you the illusion that it’s compact, the Captur is actually the longest and widest pseudo-SUV in this comparison, and it also has the largest wheelbase. The 17-inch wheels it rides on look like they were lifted straight off a concept car. Factor in the 210mm ground clearance, and the Renault Captur will make you puff up your chest if you live by the phrase bada hai toh behtar hai (bigger is better!). Both the S-Cross and Captur have some wow elements to the design, like Maruti’s LED projector headlights and the Renault’s LED headlights with LED fog lights. In comparison, the 2018 Creta is subdued. The Creta facelift wears a new front grille that makes it look wider up front, while the 17-inch wheels look sporty. It also gets new bumper-integrated DRLs that do look like aftermarket add-ons. Where the Creta’s appeal really lies is in its squared off edges. So while the other two have some hatchback-esque touches, the Creta’s styling spells S-U-V. It’s also the tallest competitor here and offers a healthy 190mm of ground clearance. While all three competitors emulate true-blue SUVs, ingress/egress is quite car-like. The easiest one to get into would be the Maruti S-Cross. It sits at just the right height and the entrance to the seat rows is also wide enough, making it quite senior citizen-friendly. The Hyundai Creta is also quite easy to get in and out of but the large side sills will be a slight challenge for elderly passengers. The Captur has some flaws here. The default driver seat height is quite tall so shorter drivers will have to “climb in”. Also, the rear passage feels narrow and is not ideal for senior citizens. Once you’re in the driver’s seat, though, all three cars give you that desirable tall driving stance. No matter which one you pick, you can see over the bonnet and you do feel like you’re quite literally a level above the rest of your fellow road users. They also have wide glass areas, so the cabins feel airy. But thanks to the Captur’s driver seat height, tall drivers (6ft tall or more) will find their view interrupted by the roof liner. And that’s where the Captur’s ergonomic flaws start irking you. Unless you’ve owned a Renault before, the controls won’t come to you naturally. Cruise control, for example, has an activation switch near the driver’s knee while the the settings are managed from the steering. The audio functions are also controlled from behind the steering wheel, which can be tricky to use at first. Even the push-button start is placed quite low in the centre console, as are the auto AC controls. Can you adapt to the Captur’s quirks? Absolutely, but it won’t happen in a matter of minutes, which can turn some away from the showroom itself. Contrarily, the layouts of both the S-Cross and Creta are easy to understand and figuring out which control is where comes as second nature. A mild annoyance in the Creta is the busy steering and, like the Captur, it doesn’t offer reach adjustment for the steering, something the S-Cross does get. Another aspect where the S-Cross shines is cabin space. While it’s the smallest car here on the outside, Maruti Suzuki has utilized the cabin space intelligently. Two six-footers can easily sit one behind the other and the generous rear seat shoulder room also means seating three abreast is possible, though the middle occupant will have to deal with the medium-sized floor hump. We also wish the S-Cross offered better rear seat headroom, as passengers over 6ft in height will find it lacking. For cabin space, the Creta comes in 2nd place. It offers ample knee and headroom for 4 adults, but the rear shoulder room is even lesser than the Hyundai Verna’s, so it falls short of being a good 5-seater. The oddball here is the Renault Captur. Even though it’s quite large on the outside, the cabin space hasn’t been used to its best. Overall rear seat knee room is lacking and while there’s more shoulder room than the Creta to seat 3 abreast, it still feels more cramped than the other two. Fortunately, the Captur’s cabin quality is appreciable. At least in terms of touch and feel, it comes across as very well built and the choice of leather in particular feels premium. The cabin employs hard plastics everywhere, adding to the sense of solidity, but a few soft touch elements would’ve been nice. The S-Cross also feels well made and the choice of leather and soft touch dashboard inserts uplift the experience. The plastics also feel well finished but in typical Maruti fashion, they do flex. Also, bits like the power window switches are still shared with cheaper Maruti cars, which dampens the experience. It’s the Creta that strikes the healthiest middle ground. The plastics feel tough but have a smooth finish. There’s no part of the cabin that feels rough/of a budget grade and while there’s nothing wow here, you do feel like you’re getting your money’s worth. And speaking of bang for buck, as you’d expect from a Hyundai, the features list is rich. Of course, at this price, certain segment staples are a given. So all the competitors here get smart keys or cards for passive keyless entry and push button start, auto AC, leather upholstery and height-adjustable driver seats. You also get cruise control, rear parking sensors, rear cameras, steering-mounted audio and phone controls, along with adjustable front and rear headrests. The Creta comes across as the best balance of needs and wants. Unique features here include a powered driver seat, wireless phone charging, and while this it is more novelty than need, the Creta is also the only one to offer a sunroof. Next up is the S-Cross and aside from the aforementioned LED projectors, it also offers reach adjustment for the steering (others get rake only). Also, the rear seat isn’t just split 60:40, each side gets an adjustable backrest as well, making it more accommodating for people of different body types. We’d also like to add that while the S-Cross is the only one here to miss rear AC vents, even in our near 40-degrees Celcius shoot conditions, the cooling never felt underserved. You need to take a closer look at the Captur’s features list to understand its proposition, as the focus is more about adding some wow elements than bumping up the degree of functionality. For example, it’s the only one to offer interior lamps and LED fog lights, which, like the Creta’s fog lights, offer cornering function. Additionally, while leather upholstery is common to all, the quality and finish is richer in the Captur. A major problem in the Captur, though, is its touchscreen. For starters, it looks too similar to the unit offered in the Kwid, which is after all a budget car. The colours look a bit washed out, the display looks aftermarket, the touch response doesn’t feel as good as it is in the Creta or S-Cross and it doesn’t offer Apple CarPlay or Android Auto. Let’s pick up where we left off, shall we, and make a clear proclamation while we’re at it. The Renault Captur is a car that needs you to adapt to it before you can start liking it. Case in point: the drive experience. It sits in the middle of the pack when it comes to on-paper numbers but the drive experience is quite different from the other two. For example, you will realize on the test drive itself that the steering is quite heavy. At parking speeds, it does need some effort to use. Then there’s the clutch. Not only is it heavy, it also has a fair amount of travel and the bite point is tricky to understand. So don’t be surprised if you accidentally stall it. The biggest issue here, though, is the powertrain. The 1.5-litre diesel engine is shared with the Duster and Lodgy, and is offered only in the 110PS/240Nm tune. Like we’ve seen before, this engine tune has a lot of turbo lag, to the point where it feels almost dead before the boost kicks in. Even mild inclines can see the motor struggle to the point of nearly stalling. Combine all these traits and you get a crossover that’s not ideal for city usage. Driving in daily traffic gets cumbersome and even though there’s no lack of power, you will have to plan overtakes. Cutting through small gaps in traffic will often warrant a downshift, so you can get the engine past 1800rpm and have enough muscle to accelerate quickly enough. You often find yourself holding onto lower gears for longer just to avoid working the gears too much. Where the Captur is enjoyable to drive is the highway. Keep the engine around 2000rpm and you can dart through high speed traffic with ease. There’s loads of mid-range punch on offer, so you can enjoy cruising at speeds in excess of 100kmph all day long. It’s here that the heavy steering also give you the confidence to shuffle through lanes while driving fast. Contrarily, the Maruti S-Cross’ engine offers just enough performance for the highway. High speed overtakes do need some planning and while you won’t feel performance lacking, there’s nothing exciting either. For that, you’d need the 1.6-litre DDiS320 which, sadly, was discontinued with the facelift. The 1.3-litre motor is a gem for city drives though. While Maruti didn’t change the tuning with the facelift, the infamous turbo lag of this engine is now better controlled. This change can be attributed to the addition of the SHVS micro-hybrid tech which assists the engine during acceleration, boosting fuel economy and delivering stronger throttle response. So city driveability is very convenient and you aren’t struggling for performance before the turbocharger kicks in. Even when you get that power spurt, it isn’t spiky and won’t catch you off-guard, so it’s new driver-friendly too. What really makes the S-Cross a great commuter is its fuel efficiency. In the city it’s miles more efficient than its rivals here and a 6th gear would’ve made it more efficient on the highway too. However, the best balance here is struck by the Hyundai Creta. The Creta’s gained a great deal of popularity for its car-like driving behaviour. So you get a light steering and light clutch, combined with a gear lever that’s a lot nicer to use than both the S-Cross’ and the Captur’s. Most importantly, there’s virtually no turbo lag, enabling easy driveability. Light throttle inputs are all you need to make your way through city traffic. Out on the highway, there’s plenty of punch for cruising or making overtakes at speeds in excess of 100kmph. The Creta was also the most fuel efficient compact SUV in our highway efficiency test. One thing you can be sure of is that none of these SUVs will let you down when it comes to their ride quality. The Creta comes across as the most comfort set of the lot. Low speeds bumps are taken care of with ease and it’s only the really large potholes that’ll make occupants uncomfortable as you will feel the Creta lose a little composure. The Creta’s high speed ride is plenty stable as well but some undulations will see the cabin get a bit floaty. Also, while the steering is one-finger-light for the city, it feels well weighted on the highway and fairly responsive through corners. It’s in this department that the Captur truly soars. The high speed ride is simply unmatched and highway undulations are brushed off as though they never existed. The stability has to be experienced to be believed and it’s very impressive for a tall SUV. Much like the Duster, the bad road ability is praiseworthy as well. While the other two in this competition give you the confidence to deal with bad roads, the Captur eggs you on to push further, turn the tables and punish the road instead! It does have a slight stiff edge at low speeds, so it’s not exactly on par with the Duster, but comes very close. Here it’s the S-Cross that offers a healthy balance. The low speed ride is comfortable and you can deal with rough edges and potholes comfortably. At the same time, it rides flat out on the highway and doesn’t have that touch of bounciness you get in the Creta after exiting an undulation. To sum up, it offers the best low speed ride and while it isn’t as good as the Captur at high speeds, it comes close. All cars here get dual front airbags and ABS as standard. They also gets rear parking sensors and rear cameras but the Creta is the only one to offer dynamic guidelines. However, a strange omission by Hyundai is ISOFIX. While the S-Cross and Captur get it as standard, the Creta only gets it with the SX automatic variant. The Creta also misses out on auto headlamps and auto wipers, which, again, the competition offers. Only the Creta and Captur get cornering fog lights, while rear wheel disc brakes are offered exclusively with the S-Cross. Unfortunately, the S-Cross doesn’t offer more than 2 airbags even in the fully loaded Alpha variant. The Captur offers side airbags (for a total of 4), while the Creta gets side+curtain airbags as well (for a total of 6). We’ll address the most obvious point here: While the Hyundai Creta (Rs 15.05 lakh ex-showroom Delhi) and Renault Captur (Rs 14.04 lakh ex-showroom Delhi) are closely priced, the Maruti Suzuki S-Cross (Rs 11.33 lakh ex-showroom Delhi) is significantly cheaper. However, this is a premium segment where price isn’t the only consideration. So which one do you choose? Let’s begin with the Captur. What the Euro crossover has going for it is the styling that makes it look like nothing else in the segment. It also feels very well built and it’s a good highway tourer, offering not just fantastic high speed stability but impressive ride quality too. Where it really falls short is in the attention to detail where it really matters. The powertrain is cumbersome for city use, the cabin space isn’t great for something of this size and the features unique to it don’t add much in terms of functionality. It’s not a car that makes a great first impression but spend some time with it and it does start to grow on you. However, put together, the usability issues are hard to ignore, which is why the Captur isn’t the winner here. Surely then, it’s the Maruti S-Cross? After all it’s the most value for money pick here and the best pick if you’re looking to ferry the whole family. It’s also the most efficient car for city use and the compliant ride makes it a good drive in the city or on the highway. However, it does have some downsides. The performance on the highway isn’t as good as it is in the other two and that’s down to the fact that the engine’s been chosen with mostly city usage in mind. Also, it misses out on the safety net of side or curtain airbags. So, the winner here is the Hyundai Creta. Much like the Verna, it doesn’t do anything in an extraordinary manner. It does it just as well as it needs to. The drive experience is the easiest in the city or on the highway and the major cherry on top remains the 1.6-litre engine’s refinement levels. The cabin doesn’t make you go wow, but the design is appealing and the overall quality is consistent and premium. It also packs in those extra features that add some distinction and functionality at the same time. The only drawbacks remain the price, which could’ve been lower by about Rs 50,000, and some strange and some surprising feature omissions, like auto headlamps/wipers and ISOFIX. Overall, it is the most expensive pick here but you do feel like you’re getting your money’s worth.